A relaxed combo again, I hope you all had some beautiful christmas days and still chilled days between the years. My current faves are definitely oversized sweaters, they are so comfy and great for winter. I received this colorful striped one from Romwe the other day, it's soft and got the perfect length, so I can even wear it as a dress. I went for a grungier combo and wore it with docs, some fishnet tights and lots of jewelry. Merry Xmas to all of you beautiful people out there!! Today for this special day I'm wearing my ultimate coat of my dreams which was probably the best purchase I made this year. It got a stunning brocade fabric, soft and gorgeous faux fur and it's so lightweight, but at the same time keeps me really warm. Hope you all have a beautiful and amazing celebration with your loved ones! Outfit:There''s blood on the moon as we plan our escape, the goddess in bloom. A casual relaxed combo for today, I really like wearing leggings lately especially when I'm in university. They're comfy, they look good with long oversized tees and really keep you warm in winter. I also layer a lot these days, it's gotten so cold. Outfit: Bleed me an ocean. Finally a look with a dress again, I hadn't worn one for quite a long time now. This beautiful piece is from Zara, I liked its combo of flowers and lace. I wanted to grunge it a bit up so I also wore my jadon docs which are so amazing! I got them recently, they have a platform which I love! and they're soo comfy. Some layering for today - I really like this combo, especially the colors. I bought a floral kashmere jacket last summer which is a really nice piece to have - it's 70s vintage and goes with almost everything. 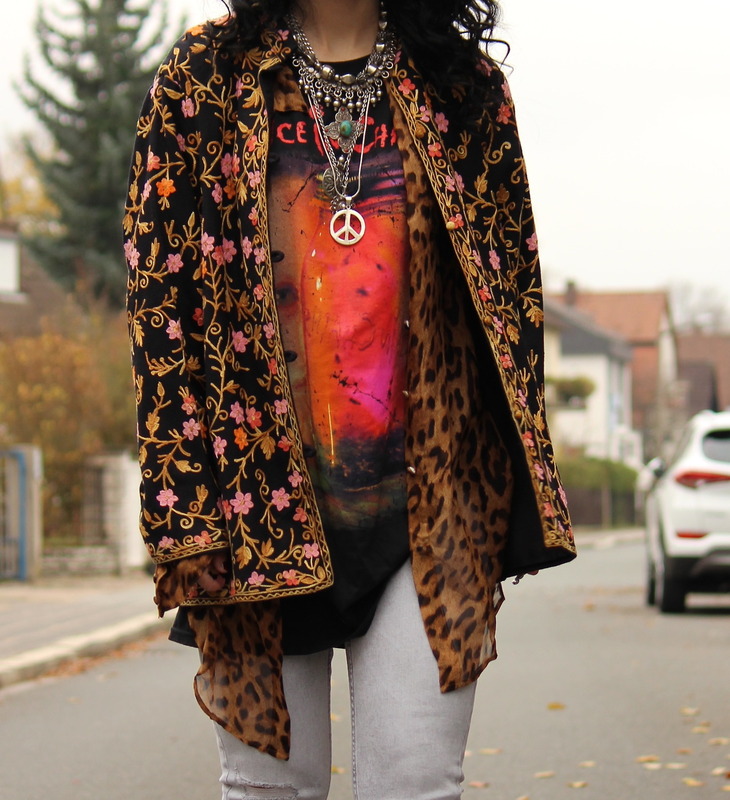 I like it most with band tees, here I'm wearing it with an Alice in Chains tee, a leopard silk shirt and lots of necklaces. some light blue/grey denim pants and platform booties. Pink is such a cool color and I found out I didn't have that many pink clothes in my closet. When I saw this cardigan at H&M I immediately liked it. I sized a few times up because I usually like it more baggy and oversized. I combined it with a printed vintage inspired shirt, a slipknot tee I got during sale, my old ripped acid wash jeans and my beloved docs. Outfit: Diamonds rain across the sky.